A new particle detector design proposed at the U.S. Department of Energy's Lawrence Berkeley National Laboratory (Berkeley Lab) could greatly broaden the search for dark matter — which makes up 85 percent of the total mass of the universe yet we don't know what it's made of — into an unexplored realm. While several large physics experiments have been targeting theorized dark matter particles called WIMPs, or weakly interacting massive particles, the new detector design could scan for dark matter signals at energies thousands of times lower than those measurable by more conventional WIMP detectors. The ultrasensitive detector technology incorporates crystals of gallium arsenide that also include the elements silicon and boron. This combination of elements causes the crystals to scintillate, or light up, in particle interactions that knock away electrons. This scintillation property of gallium arsenide has been largely unexplored, said Stephen Derenzo, a senior physicist in the Molecular Biophysics and Integrated Bioimaging Division at Berkeley Lab and lead author of a study published March 20 in the Journal of Applied Physics that details the material's properties. "It's hard to imagine a better material for searching in this particular mass range," Derenzo said, which is measured in MeV, or millions of electron volts. "It ticks all of the boxes. We are always worried about a 'Gotcha!' or showstopper. But I have tried to think of some way this detector material can fail and I can't." The breakthrough came from Edith Bourret, a senior staff scientist in Berkeley Lab's Materials Sciences Division who decades earlier had researched gallium arsenide's potential use in circuitry. She gave him a sample of gallium arsenide from this previous work that featured added concentrations, or "dopants," of silicon and boron. Derenzo had previously measured some lackluster performance in a sample of commercial-grade gallium arsenide. But the sample that Bourret handed him exhibited a scintillation luminosity that was five times brighter than in the commercial material, owing to added concentrations, or "dopants," of silicon and boron that imbued the material with new and enhanced properties. This enhanced scintillation meant it was far more sensitive to electronic excitations. "If she hadn't handed me this sample from more than 20 years ago, I don't think I would have pursued it," Derenzo said. "When this material is doped with silicon and boron, this turns out to be very important and, accidentally, a very good choice of dopants." Derenzo noted that he has had a longstanding interest in scintillators that are also semiconductors, as this class of materials can produce ultrafast scintillation useful for medical imaging applications such as PET (positron emission tomography) and CT (computed tomography) scans, for example, as well as for high-energy physics experiments and radiation detection. The doped gallium arsenide crystals he studied appear well-suited for high-sensitivity particle detectors because extremely pure crystals can be grown commercially in large sizes, the crystals exhibit a high luminosity in response to electrons booted away from atoms in the crystals' atomic structure, and they don't appear to be hindered by typical unwanted effects such as signal afterglow and dark current signals. Some of the larger WIMP-hunting detectors – such as that of the Berkeley Lab-led LUX-ZEPLIN project now under construction in South Dakota, and its predecessor, the LUX experiment – incorporate a liquid scintillation detector. A large tank of liquid xenon is surrounded by sensors to measure any light and electrical signals expected from a dark matter particle's interaction with the nucleus of a xenon atom. That type of interaction is known as a nuclear recoil. In contrast, the crystal-based gallium arsenide detector is designed to be sensitive to the slighter energies associated with electron recoils — electrons ejected from atoms by their interaction with dark matter particles. As with LUX and LUX-ZEPLIN, the gallium arsenide detector would need to be placed deep underground to shield it from the typical bath of particles raining down on Earth. It would also need to be coupled to light sensors that could detect the very few infrared photons (particles of light) expected from a low-mass dark matter particle interaction, and the detector would need to be chilled to cryogenic temperatures. The silicon and boron dopants could also possibly be optimized to improve the overall sensitivity and performance of the detectors. Because dark matter's makeup is still a mystery — it could be composed of one or many particles of different masses, for example, or may not be composed of particles at all — Derenzo noted that gallium arsenide detectors provide just one window into dark matter particles' possible hiding places. While WIMPs were originally thought to inhabit a mass range measured in billions of electron volts, or GeV, the gallium arsenide detector technology is well-suited to detecting particles in the mass range measured in millions of electron volts, or MeV. Berkeley Lab physicists are also proposing other types of detectors to expand the dark matter search, including a setup that uses an exotic state of chilled helium known as superfluid helium to directly detect so-called "light dark matter" particles in the mass range of thousands of electron volts (keV). "Superfluid helium is scientifically complementary to gallium arsenide since helium is more sensitive to dark matter interactions with atomic nuclei, while gallium arsenide is sensitive to dark matter interacting with electrons," said Dan McKinsey, a faculty senior scientist at Berkeley Lab and physics professor at UC Berkeley who is a part of the LZ Collaboration and is conducting R&D on dark matter detection using superfluid helium. 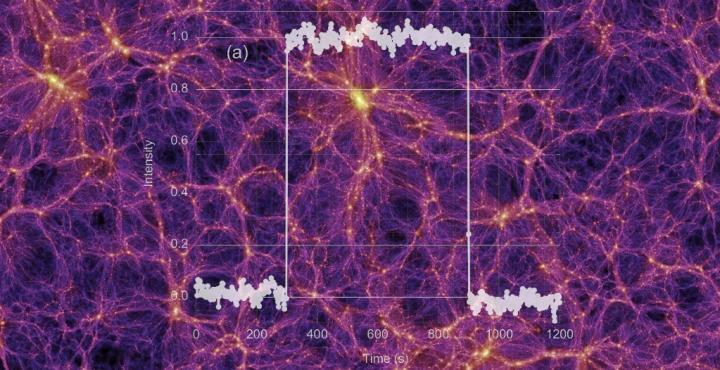 "We don't know whether dark matter interacts more strongly with nuclei or electrons — this depends on the specific nature of the dark matter, which is so far unknown." Another effort would employ gallium arsenide crystals in a different approach to the light dark matter search based on vibrations in the atomic structure of the crystals, known as optical phonons. This setup could target "light dark photons," which are theorized low-mass particles that would serve as the carrier of a force between dark matter particles – analogous to the conventional photon that carries the electromagnetic force. Still another next-gen experiment, known as the Super Cryogenic Dark Matter Search experiment, or SuperCDMS SNOLAB, will use silicon and germanium crystals to hunt for low-mass WIMPs. "These would be complementary experiments," Derenzo said of the many approaches. "We need to look at all of the possible mass ranges. You don't want to be fooled. You can't exclude a mass range if you don't look there." Stephen Hanrahan, a staff scientist in Berkeley Lab's Molecular Biophysics and Integrated Bioimaging Division; and Gregory Bizarri, a senior lecturer in manufacturing at Cranfield University in the U.K., also participated in this study. The work was supported by Advanced Crystal Technologies Inc.